The nice thing about your story Patti is that Kevin has obviously accepted being 15 again too and is ready to pick up where he left off. Obviously his heart did a little flutter when his brother or sister-in-law mentioned your name too. There must have been something a little special there for it to have survived the interval. I wish the two of you much happiness and many laughs. Thank you for stopping by and adding your kind words, David. Yes, Kevin is all for being 15 with me. You are quite welcome and what a great response! As social as you are, I didn’t realize that you loved your alone time. So many people don’t enjoy it like we do. I love this: “Yes, we’re 15 again, but what do we have to lose?” It sounds like you have lots to gain, and that should be your focus 🙂 Like with quitting smoking, just take one day at a time. Savor the moment. As I’ve said to others, Thanks! I like the “cruise control” …not to be confused with ‘sleeping’ through any of it…but, perhaps staying out of your own way as it where. I’m not making a big deal over any of it for you…that shouldn’t be misconstrued as any lack of deference, or any sort of indifference, as for me it is quite the opposite. Patti, I love the turn this post makes when you catch yourself not talking about your own feelings. So happy that you’re getting your feet wet . . . . Feet wet and water up to my shaking knees now! Woohoo! I’m excited for you! Now who told you I don’t like romance? They lie. My book is more romance than grief, and it’s called ‘Leaning Into Love.’ I lived romance and think romantic love is one of life’s greatest gift. I don’t see how people can have a marriage without that spark–especially needed when conflicts happen (inevitable) or the road gets rough. One of my dearest friends found the guy she had loved when she was 19 on FB. They’d each had two marriages and many years and experiences in-between, but the magic was there and couldn’t be denied. First it was Skype dates, then off she went from NY to CA, and a few years later they are joyfully married. When I met him (and I’ve known all the other men in her life), I thought, of course, he’s the one she is meant to be with. He’s the one. Love this story of your friend, Elaine, and everything you have written about Vic has been infused with the best kind of romance. Thanks for cheering for romance, and specifically for mine. Patti in her modesty neglected a small part of the narrative. Over the years memories tend to fade, unimportant details slowly disappear from our minds and what we are left with are the more relevant pieces of our past. I forget the circumstances of our first meeting but not the impression. Patti Hall to my fifteen year old brain was an incredible sight, tall and thin, “beautiful”. Quiet and reserved she looked every bit the part of a runway model and I was truly awestruck. She ask me recently if I had made a pass at her on our first date and I simply replied,” no”, the thought of being rejected to my young mind was unthinkable. Kevin seems like a keeper, Patti. Life is full of surprises–some of them delicious and fun. Hey, Mathair, they are very real. Every day brings fantastic light shows. 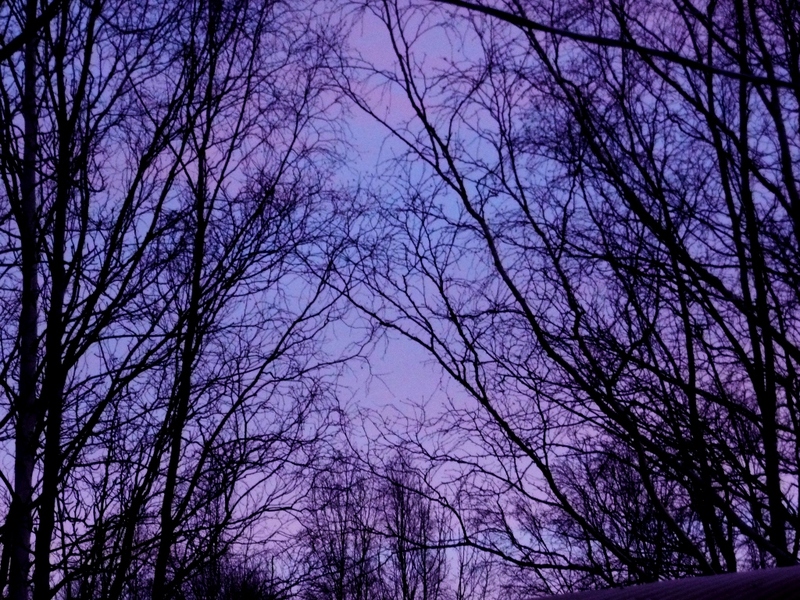 The whole side of the sky was pastel pink and blue, which blended to look purple in some areas. 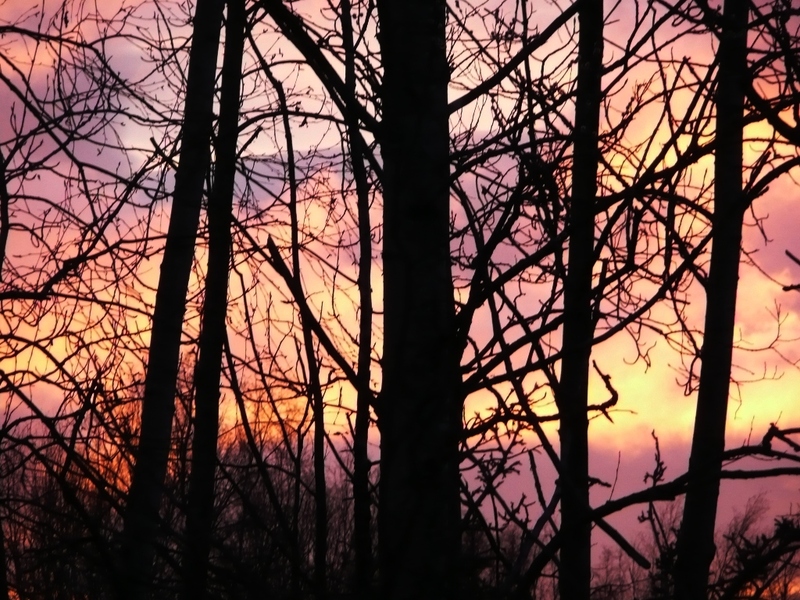 The other one is the opposite side and the sunset was more orangish through the birch trees. I’m giddy as a teen and thanks for pointing out the connection to the month of love. Duh, how did I miss that?